Due to its huge impact on the competitiveness of the industrial tissue, ensuring a sustainable raw materials supply is one of the main priorities of the European Union and naturally, of Spain as well. Uncertainty in raw materials supply has an effect on national strategic sectors such as the automotive, aerospace and renewable energies, among others. Besides, initiatives geared towards activating the transition to a new productive model that will reduce the pressure on the environment, on natural resources and raw materials, unchaining the application of less contaminant industrial processes, are also included within this Innovation Group. These are features completely related to the so-called Circular Economy. 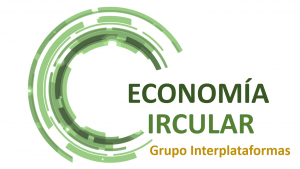 The Technological Platform MATERPLAT takes part in the Interplatform Group about Circular Economy, an initiative created to identify R&D opportunities for the adoption of the industrial symbiosis concept in strategical industrial sectors in Spain as first step in the transition to a circular economy. Moving towards a circular economy and the efficient use of resources has become one of the strategic goals of the European Union. 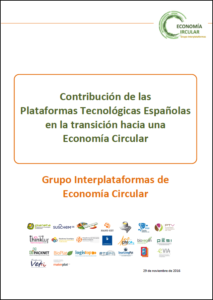 In June 2014, the Technological Platforms Planeta, SusChem-España, Food for Life-Spain (PTF4LS), Plataforma Tecnológica Española del Agua, PLATEA and MANU-KET, decided to create the Interplatforms Work Group of “Circular Economy” geared towards exploiting the potential of innovation and collaboration between strategic industrial sectors in Spain, in order to move towards a circular economy and the efficient use of resources. At the beginning of 2016, it was decided that the incorporation of new technological platforms would be highly rewarding, given that there are many sectors that can contribute to the aforementioned change of model. Currently, this Group is constituted by 23 Spanish Technological Platforms that work promoting the implementation of European and Spanish strategies in the scope of the Circular Economy through the dynamization of research and innovation actions, and setting up collaboration projects in the framework of national and international programs. After the preliminary phase of building the group up and establishing its goals, an online tool “Conectando para una Economía Circular” was developed, so that users can publish and consult information about waste materials generated by other users in different industrial sectors, which can be used as raw materials for other processes. The tool allows to consult information about technology providers directed to the valorization and reutilization of those materials. – European Innovation Partnership on Raw Materials. – PPP Factories of the Future. – Estrategia Española de Bio-economía. 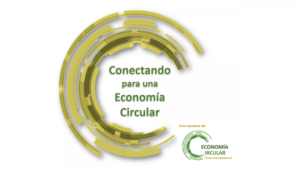 This way, the promotion of the Circular Economy is outlined in the scope of priorities of different funding programs and European and national calls such as LIFE, H2020, Plan Estatal de Investigación Científica y Técnica y de Innovación 2013-2016 or in the smart specialization strategies of various autonomous regions.